My cute Haley has some word retention issues because of her brain tumor. I’ve been reading a lot about how to help her and how to improve the damage done. One thing I can do is help her categorize her brain. When we play with animals we name a few other animals. When we eat bananas we talk about different fruits. 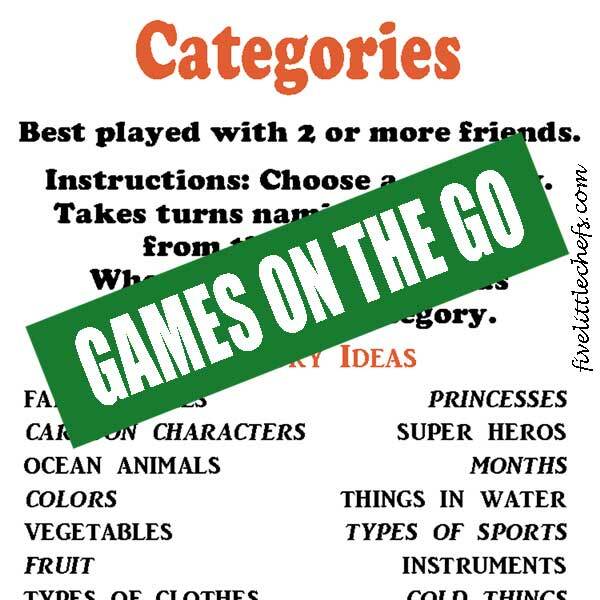 I have made a printable for this category game for on the go. When we are waiting for her next doctor appointment or just sitting in the car waiting for school to end we can get out this game and play. I have even included a list of suggested categories if you need some help getting started. All you need to do is print out the Categories Game and include it in your bag with our Snowman Dice Game. This game has been fun to play with all my kids. 1 Reply to "Categories - Games on the Go"
What a great idea, and I’m happy that it’s helping her at the same time as giving her enjoyment. Thanks so much for sharing with Adorned From Above’s Link Party. Look for the new party up tonight.